Janet Zarowitz is a Registered Dietitian Nutritionist who offers personalized Integrative Nutrition Counseling in her office in Briarcliff Manor, NY as well as remotely (US and International) via phone or Skype. As a Functional Nutritionist, Janet addresses your body’s underlying imbalances and uses nutrition to support your body’s ability to heal. Stated another way, symptoms of imbalance or diseases, (such as digestive disorders, arthritis, brain fog, autoimmune disease, thyroid disorders, cancer, allergies, low energy, etc.) occur downstream if the source of the problem is not addressed. Mainstream medicine typically takes the approach of treating symptoms. Unquestionably, it’s important to have relief of symptoms that affect your quality of life. However, the functional nutrition goes deeper, seeking to address the source of the problem through nutritional support. Examples of underlying imbalances that can be supported nutritionally include gut dysbiosis, inflammation, oxidative stress, poor detoxification, mitochondrial dysfunction, and nutrient deficiencies. Janet’s holistic approach to wellness and personalized nutrition care plans use whole-food therapies, targeted nutrition supplements, and lifestyle options for health and healing. Her recommendations are coordinated with and not in place of your standard medical care. What Can You Expect at Your Nutrition Counseling Appointment? what are your nutritional concerns? do you have specific health and nutritional goals? what motivated you to seek my help? You will be sent a comprehensive intake form which includes a deep history from childhood, to complete. You will also be asked to obtain your most lab work and to complete at least a few days of a food log. When you actually meet (in person or via telephone or Skype) she will delve further into the details of your medical and nutritional history. This will include your symptoms and any approaches you may have already taken to address your problem(s). Her information gathering will expand upon the food you eat, medicines and supplements, medical markers and lab test results. If you are taking supplements, please bring them so that they can be evaluated. Your work and home environments as well as degree of daily stress will be taken into consideration. Many things go into making a holistic assessment! At the end of your “give and take” session, Janet will discuss her assessment and get you started on a personalized approach to support your health. Strategies are designed to be practical and sustainable for you. Goals and time-frames will be realistic. You follow-up needs will be discussed. An appointment for your next session will be set up for monitoring your progress and adjusting and next steps for the plan. Your first follow-up session is usually scheduled for about 3 weeks to see how you are responding to the recommendations. Going forward, follow-up sessions may be spaced weeks, months or even a year in the future, depending on your situation and your preference. Payment for sessions is expected at the time of service. You may prepay for a visit for yourself or as a gift for someone else. While Janet sees most of her clients in-person, which is preferred if possible (especially for the first visit), she is also available for phone and Skype consults. Janet is frequently contacted by people from other parts of the US or the world for some of her specialized services, such as Nutrigenomics consultations. 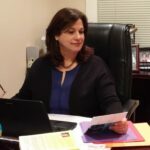 Her office is conveniently located and easily accessible to clients from Westchester County, NY and Rockland County, NY. The building has free parking.